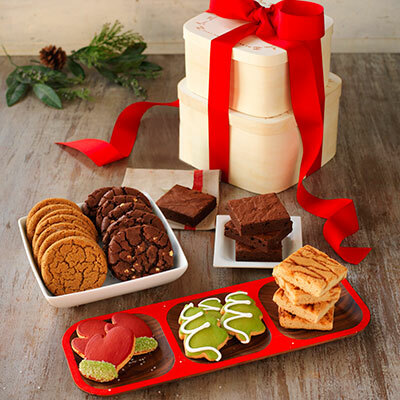 “Sweet” Hostess Gifts from Dancing Deer Baking Co. Looking to show up with something more festive than wine? The Christmas Gourmet Bakery Tower from Dancing Deer Baking Co. will delight your hostess’ sweet tooth long after the guests leave. 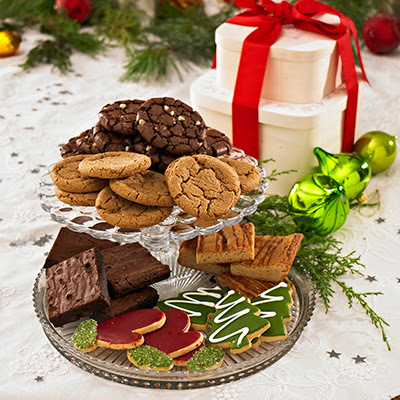 Dancing Deer Baking Co. is a leading national provider of gourmet food gifts and delicious scratch-baked cookies and brownies for consumers and businesses. Dancing Deer’s online gift sets, ranging from $20-$125, offer hassle-free, online shopping with a personal touch. From hostess gifts, clutter-free gifts or a gift that gives back, Dancing Deer can solve the holiday’s trickiest shopping and entertaining dilemmas. This tower is delivered in two environmentally friendly keepsake wooden boxes and tied beautifully with a bright red grosgrain ribbon. This gift tower is perfect for corporate and holiday gifts. You can purchase the Christmas Gourmet Bakery Tower for $54.99 from the Dancing Deer website. I am so addicted to their Molasses Clove cookies!